Ok, I must give you a quick warning. 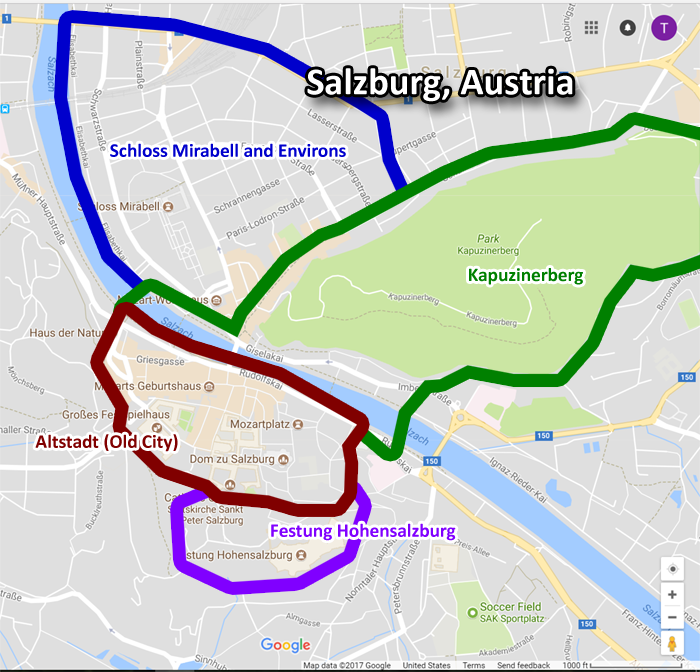 If the very thoughts of the “Sound of Music” or Wolfgang Amadeus Mozart causes you convulsions (especially because of the movie “Amadeus” or the bizarre hit song by Falco), you might consider (a) not considering a trip to visit Salzburg and (b) not reading further in this travelogue. Why? Because Salzburg is not only the birthplace of the great composer himself, it is the commercial center of the Mozart name, where it seems sometimes that one can hold a degree of fame by claiming to be the third cousin of the illegitimate child of the great-granduncle of a man who once spotted Mozart walking down the street. Northwest Austria cornered the market on hero worship long before Beatlemania. As for “Sound of Music,” this is the city where much of the movie was shot on location. If you’ve been to the city, you would recognize some of the shots used. If not, no problem, Salzburg offers plenty of “Sound of Music” tours where visitors can be taken all around to see where the children sang Do-Re-Mi, where the Nazis marched during the Anschluss, and the gazebo where the teenaged lovers sang before fate tore them apart. Of course, Salzburg is one heck of a lot more than just Mozart. It is a beautiful old city in its own right, especially in wintertime. The beautiful, clean, and well-kept buildings in the Old City complement a healthy dose of the ‘white stuff’ very nicely. The Hohensalzburg Castleis an absolutely gorgeous castle, providing a spectacular view of the Altstadt and the Salzach River, and also serving as a classy restaurant and concert hall. As climbs to medieval castles go, the Hohensalzburg is a bit steep, so if you are not up to the climb, there is a funicular train available (you see the tracks in the right side of the photo). Visiting the Castle is very inexpensive. Also, the North Bank of the city includes the fabulous Mirabellenplatz and the Kapuziner Kloster with great vantage points over the city. This part of town is perhaps better visited during the summertime as the Mirabellen is a flower garden facing toward the Castle. This travelogue combines photos and experiences from two trips — during the wintertime in 2002 and the summertime in 2008. Some photos will be shown in pairs to reflect winter and summer views. Below is a (planned) interactive map of the four posts (coming soon).